Siddhartha wanders into the forest knowing that he can never go back, and feeling that the songbird inside him has died. He is full of the disgusting greed and excess of the town. He longs for something to happen to him, to be dead. He longs to stop awakening. He believes that it is barely possible for him to continue living with such deep sin inside him. He reaches the river, which had seemed like a symbol of hope before, but now it speaks of destinations, and Siddhartha cannot imagine his next destination. He can only think of death. Siddhartha is so determined to find the path to enlightenment, and so bred for holiness and meant for this high calling, that when he feels this part of him disappear, it is as if life is over. The life of the child people is not the right kind of life for him, and as it seems like he has come to a dead end on his path, even the world around him feels futile and insufficient. Siddhartha leans on the branch of a tree and watches the flow of the water and wishes to become part of it. He feels that he is at the end, that there is nothing left but to end himself and give his body to the crocodiles and creatures of the river. He sees his reflection and spits at it. He lowers himself closer to the surface, closer to death. But he hears something. A word, a sound, comes to him, from deep in his soul. It is the ‘om’, the perfect word. He suddenly realizes how close to death he had come and how miserable he was, and remembers the holiness he had forgotten. Having lived the exhausting life of a merchant and been taken in by the games of business and wealth, Siddhartha feels an essential separation from the natural form that had once inspired him. The word ‘om’ that he had spoken so deliberately as a young man and as a seeker of knowledge now comes to him as the water does, naturally and easily, showing that the oneness and wisdom that he seeks is part of natural life, not his own intellect. After this moment of realization, Siddhartha falls into a deep sleep by the river. As he awakens, he feels that years have passed, and he sees the full beauty of the water and the heavens again. He struggles to remember his life up to this point, everything seeming so far away. But he remembers how the word ‘om’ had come and saved him, and he utters it again now. He feels transformed by this wonderful sleep. At times, the natural world, and even his own body, act beyond Siddhartha’s control and restore him. We see in the hypnotic and restorative power of the river and holy word combined how nature and unity are the key to Siddhartha’s spiritual survival. Then Siddhartha notices a yellow-robed man sitting near him. At first, he thinks the man is a stranger but then he recognizes him as Govinda. Govinda has aged, like Siddhartha has, but still wears the expression of devotion that he always had. He is delighted to find Siddhartha awake, but he does not recognize him. Govinda introduces himself as a disciple of Gautama and explains that when he saw a man sleeping, where snakes and other dangerous creatures go by, he wanted to wake him up. Seeing how deep the sleep was, Govinda decided to stay and watch over him instead. Govinda seems to instinctively care for Siddhartha and continues to be his shadow. There is something is Siddhartha’s spirit that attracts this care but also something in Govinda’s character that is still so devoted and loyal. Govinda’s and Siddhartha’s unchanging bond despite having become old men away from each other suggests the timelessness and fatedness of their paths. Siddhartha thanks Govinda and, as they part, calls him by his name. Siddhartha explains how he knows him and Govinda is very pleased to see his old friend Siddhartha, and very surprised that he did not recognize him straight away. Siddhartha thanks him for being the sentry to his sleep. He asks Govinda where he is traveling. Govinda replies that he is always on the move, going nowhere in particular, such is a monk’s life. Siddhartha says he too is always on the move. Govinda believes that he is on a pilgrimage, but is confused as to why he looks like a townsperson, with perfumed hair and rich clothes. His old friend Govinda, just as he began as a shadow, still shows true devotion to his old master, as if he has a special sense for his wellbeing. Even though both men have changed and their paths no longer align, it seems that Govinda’s path has been made to intersect Siddhartha’s just at key moments. Siddhartha reminds Govinda that the world is ephemeral. Outward identities are passed through as one passes the stages of life. Siddhartha has been a rich man and a samana but now he doesn’t know how to describe himself. The formations of the ephemeral world he is trying to explain are swift. Still puzzled, Govinda says goodbye to Siddhartha and Siddhartha watches him go, fondly. After that long sleep and hearing the ‘om’ again, Siddhartha is full of love. There is an ease to Siddhartha’s explanations of life that makes him the natural authority, above Govinda. While Govinda, even as a grown man, is as full of questions as he ever was, Siddhartha seems to have progressed, and his peaceful explanations reflect his peaceful nature. Siddhartha is suddenly very hungry, and laughs at the memory of reciting his three skills to Kamala, waiting, fasting and thinking. Those skills have left him now. He traded them in for quick childlike passions and became a child person. He finds thinking hard too, but forces himself to ponder on how he had started life with nothing and now he is standing here with nothing again. He has gone downhill, he thinks, but he is not sad, he laughs, and is happy to compare himself with the river, going cheerfully downhill. He remembers that he almost drowned in the same river, but the memory is dim like a dream. 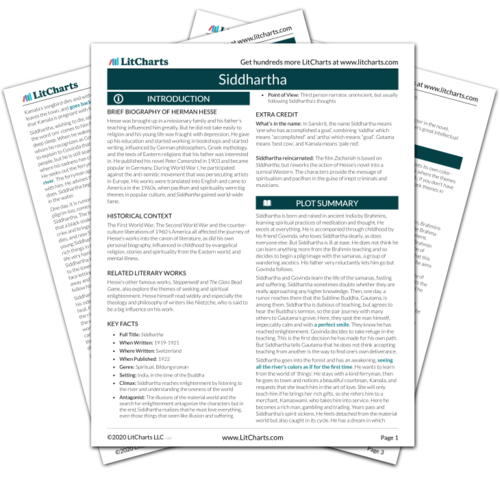 The cycles of awakening and unease that the stages of Siddhartha’s path have brought him become clear now. But in their clarity, they do not seem inescapable as they once seemed. It is as if recognizing the cycles is an important step to overcoming them. The beloved river is an example of a good cycle, because it is always regenerating and always inspiring. Perhaps just like the river, Siddhartha can keep his voice clear throughout any cycle. Siddhartha goes through the twists and turns of his life, from a Brahmin’s son to a rich man and each awakening in between. He describes the rich man stage as having to forget and unlearn what he had learned. Like this, he reflects, he has become a child again. Even though he had to go through such distress and spend so many years unlearning, he still feels deeply that it was right. He needed to go right to the bottom to be able to rise again. Joyfully he accepts where he has been and is excited to go wherever his path will lead him next. The path of an enlightened one is not necessarily a linear path, and a life isn’t necessarily a linear, chronological experience. 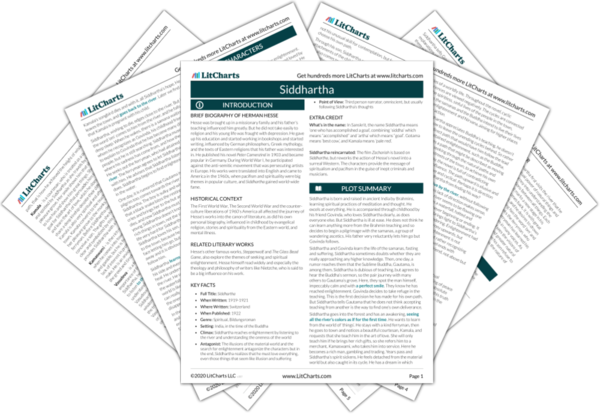 Siddhartha has been transformed from one version of himself into another. He has cheated time, and lost it too. But the awareness of his own indirection seems to make his goal clearer. Siddhartha muses on where this happiness has come from, whether from the word ‘om’ or the sky, or somewhere else. He marvels how he has come from such a loathsome place, where everything smelled of perfume and he despised his own behavior. And he congratulates himself now on turning his self-hatred around and following the inner song bird again. He reflects that as a child, he had known that those kinds of worldly pleasures were not good, but he had not experienced it until now. The power of nature is extreme, able to wash away not just the perfume and material signs of the town, but also its anxiety and sin. Looking at where Siddhartha started, as a child, aware of the shallowness of worldly pleasures, it doesn’t look like he has progressed very far along his path to enlightenment, but the difference between knowing something intellectually and actually experiencing it is great, and Siddhartha has progressed in wisdom from his experience. Siddhartha keeps pondering and wonders, if it is not the song bird that died, what part of him died today so that he no longer wanted to kill himself? He decides it is the ego, with which he has been warring all this time, that has died and allowed him to see the world as a child does. He understands now why he always fought with his ego. He had been surrounded by too much knowledge, too much seeking, and his pride was built within this holy knowledge because he was so talented. Siddhartha struggles to figure out the various parts of himself. He is made of human parts, and feels human emotions and temptations, but he is also made of these eternal things, the holy word and the voice, which connect him to the river and the world. His ego, his essence, then, is a tricky animal, found in all of these parts of himself. It’s understandable that it is difficult to define and satisfy the ego. Siddhartha knows that he had been right, he couldn’t have been taught any more. He had to go into the world to learn what he has learnt about his own ego. He had to grasp and desire until he was sick so that the grasper and desirer in him could die. And now he has awoken from sleep a new Siddhartha. Now he greets the voice of the river and his hungry stomach with a smile. He feels a deep love for the water and believes it still has something to give him. The confrontation of nature again restores Siddhartha’s spirit. His path has been a series of gorging and purging, having too much of one thing and seeking another. But despite its twists and turns, the path is good. Everything has been necessary and has provided Siddhartha with a wisdom that is individual to hi and his experience. Parfitt, Georgina. "Siddhartha Part Two, Chapter 8 – By the River." LitCharts. LitCharts LLC, 16 Sep 2013. Web. 11 Mar 2019. Parfitt, Georgina. "Siddhartha Part Two, Chapter 8 – By the River." LitCharts LLC, September 16, 2013. Retrieved March 11, 2019. https://www.litcharts.com/lit/siddhartha/part-two-chapter-8-by-the-river.